Congress trained its guns on the National Democratic Alliance dispensation on a wide range of issues including economy, employment, price rise and foreign policy. “Dull and dark shadow crept over India in the last two years,” Congress on Saturday said dismissing the government’s claims on performance on completion of two years in office and slammed it for alleged “systematic attack on institutions, icons and inclusiveness”. “As the second year of the Modi government draws to a close, sadly there is little to celebrate,” it said. “Muscled thugs impose their ideas of morality and lynch mobs kill people on mere suspicion. Bharatiya Janata Party leaders spew venomous messages of hate and violence to question the patriotism of every Indian who disagrees with them,” the party said in a 59-page booklet, titled “Pragati Ki Tham Gayi Chaal, Do Saal, Desh Ka Bura Hal” (The pace of progress has stopped. Two years and the nation’s bad plight). 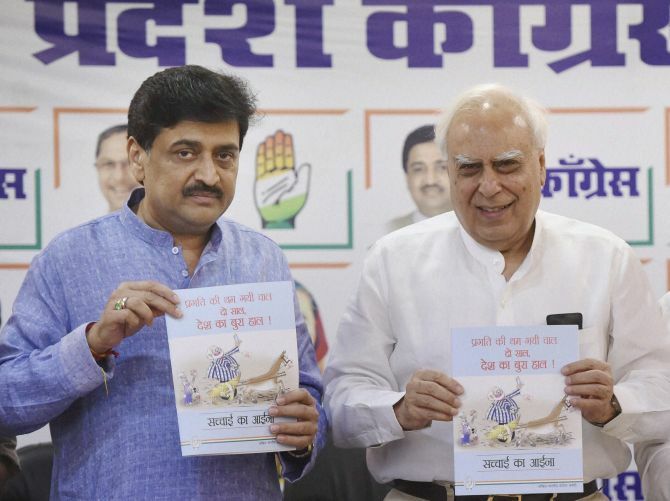 Claiming the booklet to be “Sachchaai Ka Aaina (Mirror of Reality), Congress trained its guns on the National Democratic Alliance dispensation on a wide range of issues including economy, employment, price rise and foreign policy. The party went hammer and tongs at the NDA government over its role in Congress-ruled Aurnachal Pradesh and Uttarakhand and accused it of “murder of democracy and subversion of federalism”. Ahead of Uttar Pradesh assembly elections in 2017, the party tried to paint the Modi government as “anti-Dalit” citing Rashtriya Swayamsevak Sangh chief Mohan Bhagwat’s last year remarks on caste-based reservation. The party alleged that Modi and his government are “surreptitiously following the RSS agenda” through its actions and policies including “systematic withdrawal of schemes for SCs/STs/BCs and by imposing budgetary cuts”. “The last two years have seen a dull and dark shadow creep over India. People are bewildered and confused. Instead of promised ‘achche din’, they are witnessing a systematic attack on India’s institutions, icons and inclusiveness. “As the second year of the Modi government draws to a close, sadly there is little to celebrate. Job growth, industrial output and exports are all plunging downward. Inflation, rural distress, drought and low farm incomes are making life miserable for kisan and khet mazdoor,” the booklet said. Congress accused the government of making a U-turn on black money issue and announcing an amnesty scheme in 2016, which it called “Fair and Lovely Amnesty Scheme 2016”. It also accused the government of taking “no action” on Panama Papers expose, which showed alleged bank accounts of several influential people in tax havens. The booklet also raised suspicion over the government’s claims on GDP growth. “Officially, the economy grew at 7.3 per cent in 2014-15 and 7.6 per cent in 2015-16 based on the new method of GDP calculation. But there is broad scepticism about the reality of this data. “Even the governor of RBI and government’s Chief Economic Adviser expressed discomfort with the official growth data. Experts all across believe that the actual growth rate is in the neighbourhood of 5.5 per cent,” it said. rise in prices of pulses and other commodities. Alleging that the Modi government has “betrayed” the youth and has an anti-student agenda, the booklet also mentioned incidents like the sedition row in Jawaharlal Nehru University, Film and Television Institute of India Pune controversy and and Rohith Vemula’s suicide in Hyderabad Central University, alleging that “doctored videos were used to target student leaders opposed to RSS’ ideology”. “Two years ago, the people of India fell for Modiji’s web of deceit woven around good governance and development. After two years, deep disappointment of people is loud and clear across the nation. The tragedy is that people of India need to wait for three more years to put the ‘bure din’ of the Modi Sarkar behind them. How have Modi and his mantris fared?